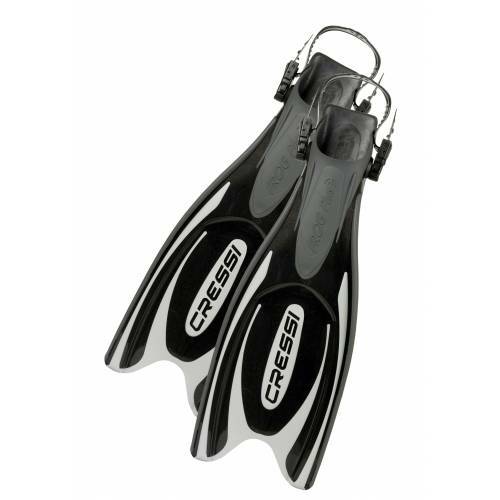 Cressi’s latest addition to its extensive line of world renowned fins is the Frog Plus open heel scuba diving fin. The Frog Plus features many of the great characteristics of a traditional paddle fin along with introducing a revolutionary new blade material that is both extremely durable and nearly indestructible. The Frog Plus utilizes Cressi’s patented three material injection molding process. The three materials consist of a nice comfortable rubber on the foot pocket that extends up the side rails of the blade. The second material is the revolutionary new dual density techno polymer which forms the blade, and in conjunction with the third silicone based material creates a channeling effect. The channeling effect is the characteristic of the fin that enables a high level of energy to be transferred in both up and down strokes of the kick pattern. The Frog Plus also incorporates Cressi’s patented positioning of the foot pocket below the blade. This design increases the working surface area of the blade by 20%. The combination of the channeling effect and the foot pocket mounted beneath the blade creates a very powerful and efficient fin with minimal leg strain. Because of these characteristics, the Frog Plus fin is an ideal choice for the entry level to advanced diver.